1. THE most important thing is safety of the fish. 2. To be as tangle free as possible. 3. To be strong enough to land fish. 4. Balanced hook and bait size. 6. Effective on the area of lake your fishing. 7. Don’t over complicate things. 8. Don’t follow the latest fashion. 9. Think for your self, it more rewarding and will help you in the future. The most important thing is safety, making sure that if your main line breaks for any reason the fish can get rid of the lead, and would not be trailing round too much that can cause damage to the fish. Please think of the fish. As tangle free as possible, I have never found a rig to be 100% tangle free ( Except perhaps for the chod rig ), but there are a few things we can do to help. One of the most important things in my eyes is to feather the cast and feel the lead down to the lake bed. Not only will this help with reducing tangles it will also give you have an idea what the lake bed is your fishing over. This is one of the most important things in my fishing ( and it costs nothing ). If there was one thing I could teach someone in fishing this would be it. Getting back to the rig you have to think of the whole thing from the start of the leader or tubing down to the hair stop. The first thing to think about is what the lake bed is like your going to be fishing over. This will help you decide what you are going to start off with ( once again going back to the important thing of feeling the lead down ). Rigs today with all the articles in the mags and videos are far to complicated and generally for a particular fishing situation that would only go to confuse someone trying to decide on which rig to use. Keep things simple that way there is less things to go wrong or hinder the rig working effectively, yes there can be times when you ( may ) need something more complicated but that is not as often as you may think. Starting off with the choice of leader, firstly check what the rules of the lake are. Once you have found out that follow the rules. I persionally use the lead free leaders and splice my own making them all the same length ( I like to be consistent with all my fishing ). Most of my fishing is with a lead clip, that way I can change to different leads easily and also be able to drop the lead on the take, ( very useful when fishing in weedy waters ). You could also use an inline lead or a helicopter setup. Which ever one you chose please think of the safety of the fish. Now from the lead down, ( you may think that it’s a long way into this for me to start talk about the actual rig but I feel what I’ve already wrote is VERY important). The first material to think about is nylon, it’s cheep and easy to work with. A simple rig tied compleatly with nylon including the hair has caught a lot of fish over the years and should not be neglected because it’s not the latest all singing all dancing rig that someone has decided to write about. This would be efective over a lot of different lake beds by just adjusting the length, ( the clearer the spot your fishing over the shorter you can tie it and lengthen it in weedy/silty spots ), it also it suits lots of different hook baits and hook patterns. Next would be braid this can be used straight through including the hair the same as nylon but not as tangle free. When using this it would be advisable to use a PVA bag or stick on the rig to try to help reduce tangles. This also can be used over different lake beds at varying lengths to suit. Next would be coated braid, slightly less prone to tangles than uncoated braid, a little bit harder to use as generally you have a portion of the coating stripped back mostly round the hook and hair, which can be hard to judge how much to strip back. ( I’ll go into details later ). You may notice the I have been writing quite a bit about the tangling side of rigs this is because it’s something you need to think about, as a tangled rig on the lake bed is next to useless. There is nothing worse than reeling in a tangled rig in knowing you have had feeding fish in the area that you could of caught with a properly presented rig. I hear you thinking that’s ok I’ll use a chod rig it very rarely tangles, you may be right and it will catch you fish on certain times and situations but it is not a wonder rig to be used everywhere and all the time as some people do, because you will catch a lot more fish uing the right rig in the right situation. 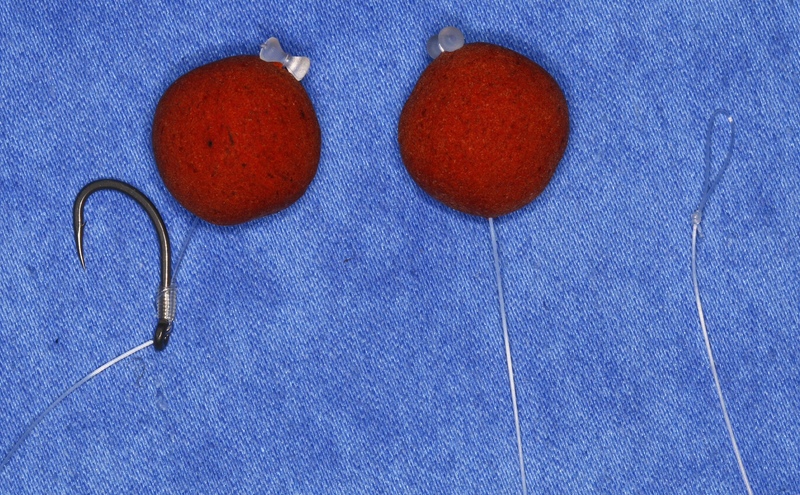 These three should do you for a lot of your fishing, the other main materials used for rigs would be a stiff type of nylon, and fluorocarbon or a combination of materials. These would be a bit more advanced, ( I use the word “”advanced”” because they would be harder to tie and suit certain situations). Not because you need to be advanced to use them. If you notice I have not mentioned any particular products at this stage this is Because I feel that different makes and styles of hook links and hooks suit different people and you should experiment with them to see what suits you. I will give you some that I feel is a good starting point, from there you can progress to what suits you and you fishing situation. Try and think for yourself and don’t follow the fashion by using the latest so called wonder rig because there is no such thing. The first rig to start on would be one with nylon line straight through, you can use the same line as on your reel or a bit lighter breaking strain, first tie loop for the hair and put on you hook bait and a hair stop. The size of bait will determine the hook size, but only as a guide, a 15mm boilie with a size 8 hook, or an 18mm boilie on a size 6 hook would be a good starting point. 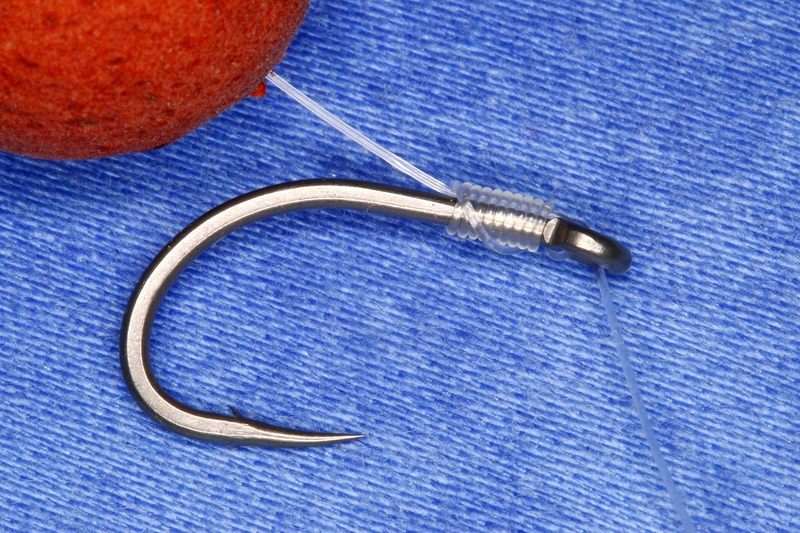 A straight eyed or slightly down turned eye ( a boilie / wide gape ) type of hook to start with can tie the no knot with the boilie just off the bend of the hook. ( see pic ) the loose end can be tied to a swivel, or a loop depending on which way you attach to your lead system. At this is the point you can decide the length, around 8-10 inch to start off with should get you going. This may sound very basic but it is a very efective rig. I think carp anglers tend to make things far to complicated, thinking that they won’t catch unless they use the most complicated rig and latest “”wonder”” bait. You can tie up the same rig using uncoated braid with the addition of a line aligner on the hook. You can use the ready made ones ( a few company’s make them ) or you can use shrink tube ( see pic ) again the length can be adjusted but I would start off a little bit shorter as its a bit more supple than the nylon. Again when using this its best to put on a PVA bag or stick on the rig before casting out to help to reduce tangles. Also it may be worth thinking about putting a small bit of weight on the braid as quite a few braids don’t sink well, you can use some of the putty or ready made ones that are available from quite a few company’s. Moving on to coated braid, there are quite a few different ones that have a variation of stiffness with the outer coating, with some of them needing to be passed over steam to straighten them. Choosing which one to use can be difficult as there is a lot to choose from, if you haven’t use any before it would probably be best to start on one that’s not too stiff. Also when finishing the rig be careful when you tie the knot as the coating can split when it is tightened. To start off tying rigs with coated braid you should be aiming to have an uncoated section around 1/2 inch down from the eye of the hook which should be a good starting point. To achieve this, first would be to cut a length of the material around 8 inches longer than what you want the finished rig to be, then stripping around 6 inches of the coating and tying the loop for the hair on the end of this. 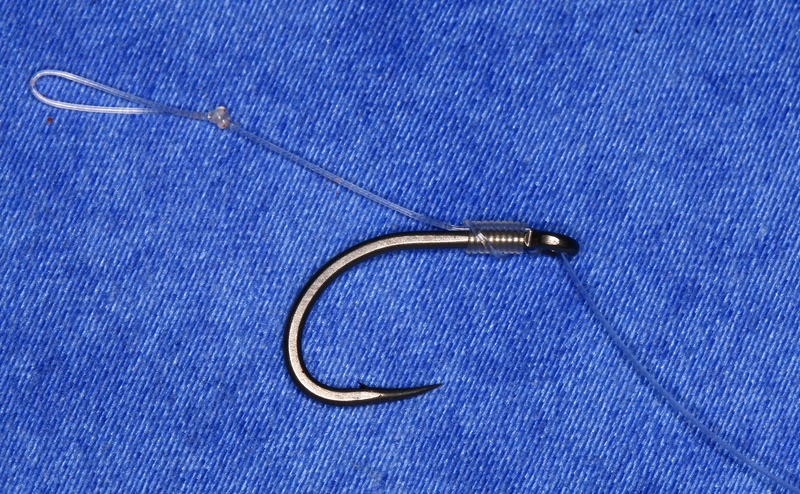 Then tying the rig up the same as the uncoated braid which should leave a short section of uncoated braid down from the eye of the hook, this is where it takes a bit of judgment to get the uncoated bit below the hook the length you want. 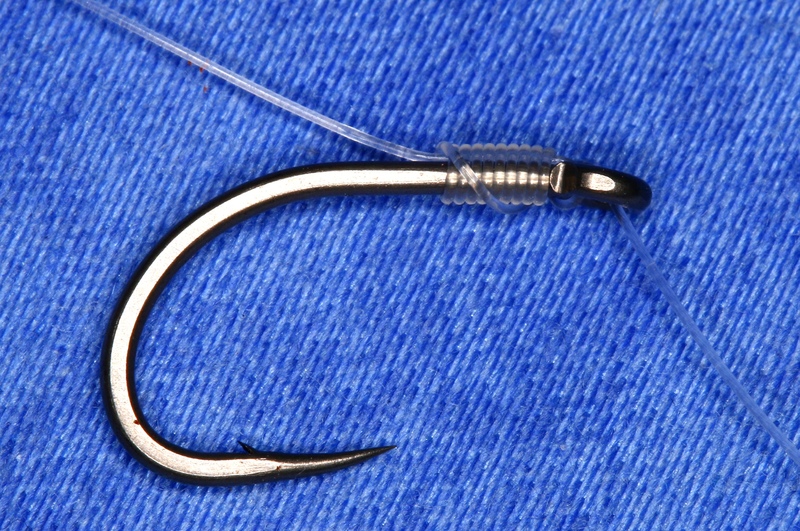 ( you can adjust the length with the amount of turns round the hook when tying the no knot ). It’s a case of trial and error to get it right. 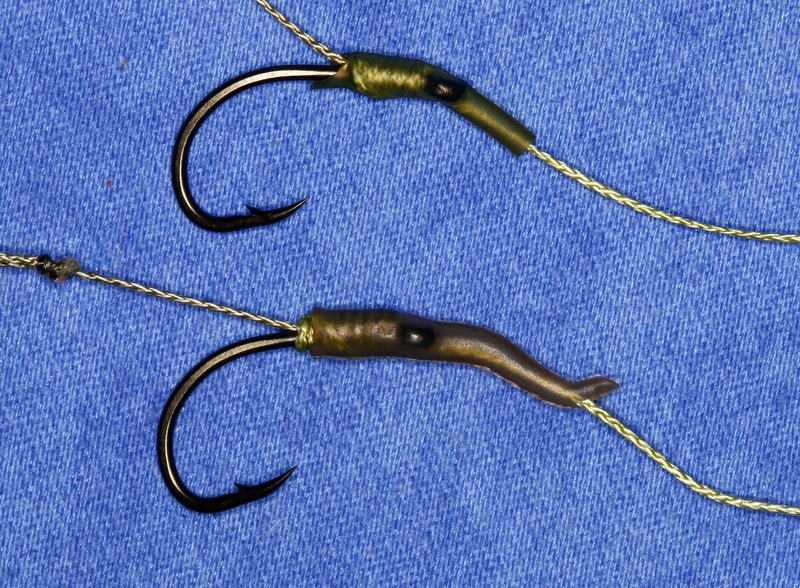 Then finishing off with a hook aligner of your choice, and tying a swivel or loop on the other end to the length that you want. Thinking about what you are fishing over will help you to decide what type of rig and lead setup to use as a starting point ( again going back to the importance of feeling the lead down ) also what type of hook bait. 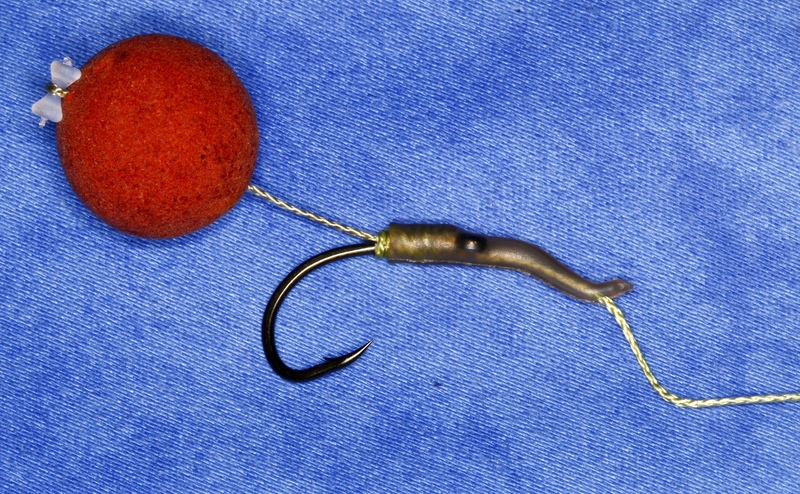 On clear spots start off with bottom baits or snowman ( bottom bait and slightly smaller pop up both on the same hair ), and when the spot is not as clear try a pop up ( by placing a split shot on the hook link below the hook carefully, adjusting the weight and distance from the hook to suit the pop up and spot your fishing over. I’m not writing this to tell you what to use but to get you thinking about your fishing, as I feel this is the most rewarding way of learning. There is far too much about that states you should fish with this rig or that rig with this latest bait and you too can catch all in front of you. As I feel all this produces is clones that don’t tend to catch anywhere near the amount that an angler thinking for him self and what they are fishing over will. This entry was posted in Carp and tagged carp, rigs, Rob Coleman. Bookmark the permalink.